OK, maybe someone can sticky this thread so people can post bug fixes that they have found, to help those still having trouble. BUG: Crash in Forge of Xshathra (sp?!) when killing DK near where you get Knight heavy armour. DESCRIPTION: After the door opens and you jump across the lava you see a Dark Knight with a 1000 potion. If the enemy display at the top of the screen shows more than one DK, as soon as you kill him the game will crash. FIX / WORKAROUND: This error only seems to occur when you have saved somewhere earlier in the level. If you don't save until you reach this point, you shouldn't see this problem. 1) At the end of Oasis of Nejeb, when you walk into the big room with the pillars and are attacked by 4 skeletons. Your character will just wander into a wall and try to keep walking while the skellies hack him/her to pieces. 2) In the Abyss just before you meet Meskalamdug for the second time. Your character will run round in a circle and off the edge of the platform into the abyss. FIX / WORKAROUND: I fixed this error by enabling vsync in display properties. Look for "Wait for vertical refresh" in ATI Catalyst Control Centre (select "No Preview" from the 3D menu at the side and scroll down to find this option). If you don't have ATI CCC, look for a similar option in the 3D card-specific settings under Display Properties. Alternatively keep hitting the Print Screen key while the cutscene is playing, to slow the framerate. If you still have problems with cutscenes after enabling Vsync, then I don't know what to suggest, though the Orb cutscenes in Orlok (when you collect it and when you place it on the ground later) can both be skipped by pressing [ESC]. It's only really a major issue with cutscenes that cannot be skipped. 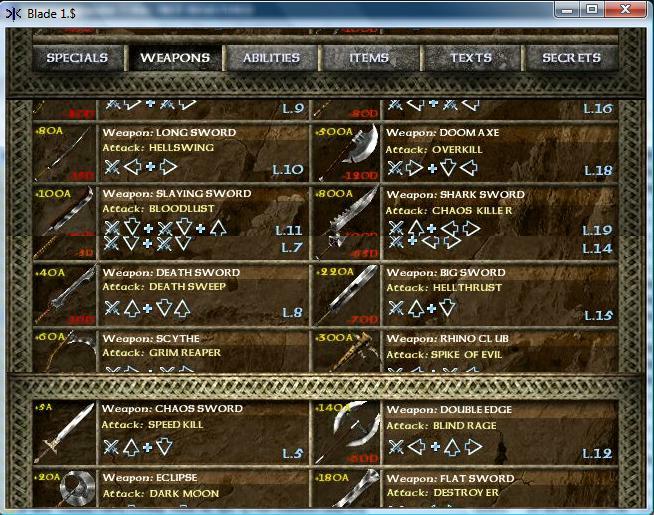 DESCRIPTION: Just as you select "yes" to save a game the screenshot is taken for the load/save menu and the game CTD's. Loading the game again loads an old game that was saved in that slot previously, not the game you tried to save. FIX / WORKAROUND: When saving wait about 10 seconds before hitting the final "yes" to confirm. (allow the reverberating menu selection sound to stop playing completely). I'm having this weirdly mixed up images. This "F1" one and the loading screens during the launch of the game. This happens only with the rOpenGL graphic setting but it's the only setting that is playable for me. I only chose windowed mode to be able to capture the screen otherwise I play in full-screen mode. If anyone has/had similar problem or knows how to fix it, any help will be appreciated. Thanks. Just another weird bug. I've had it happen with menu images but never with the info screens. Quickest way, which I did years ago is to find the .jpgs in the game files and print them out. The colours need correcting, but are still readable as they are. hello i am having a issue with taking no damage. I am at the very first boss of the game after i picked up the power potion. I did not use it, it was in my inventory but after that i am invulnerable to everything. What causes this problem ? Yes that is a known issue that can happen in certain circumstances. It's something to do with the swinging pendulums rather than the potion. Only easy solution once you are invincible is to carry on or reload from a pre-pendulum save. You should go back to normal damage on the next level. So my problem is I got the GOG.com edition of the game installed....it installs fine but when I go to configure my settings and then launch the game I get this error after a black screen pops up "MEM_RESIZED_FAILED" followed by a Micrisoft Visual C++ runtime error, something along the lines of abnormal program terminator etc......any help guys!?!?!? i've tried every video mode/driver/resolution whatever you want to call it but nothing work, any specifics specs I should set it to or what? I found a solution to this problem, simply go to the folder where your game is installed Blade of Darkness/Data/video ... rename the folder "video" to something else, it should﻿ skip the intro, but the game finally loads, only problem now is MY SCREEN FINISHING LOADING AND I ARRIVE AT A EMPTY ROOM AND EVERY BUTTON I PRESS Says something like "no command selected" , the glitches just don't end for this game do they? I don't have the GoG version, but I believe it uses the nGlide 3DFx wrapper. "The only solution is to solve the whole mystery, and return home as soon as possible." 2. in Xshathra (Volcano_M14) after passing Dungeon door and fighting with first Dark Knight (at left to the door) crashing in this lateral "corridor"
Last edited by cieply on Fri Jul 29, 2016 3:01 pm, edited 5 times in total. Just as you select "yes" to save a game the screenshot is taken for the load/save menu and the game CTD's. Loading the game again loads an old game that was saved in that slot previously, not the game you tried to save. In my case, this only happened when trying to overwrite saves from previous levels. If I started a new level, I could make a new save and keep using it for that entire level. If you try this, obviously be careful and maybe make back-ups of the contents of that folder. I've registered an account here mainly to the intent that I may let you know I've come across what's probably the closest thing to a perfect setup for running BOD. I discovered this entirely by chance, I wasn't looking for it. I just happened to have this computer laying around, that someone had entrusted me to have repaired, but never bothered to return and pick it up. Sticking to an old GF6 video card with non-contemporary drivers worked well for very much everything except BOD, only now have I realized.
. CPU = Intel E5300.
. Socket = 775 LGA.
. Northbridge = Intel G41 rev. A3.
. Southbridge = Intel 82801GB (ICH7/R) rev. A1.
. Intel(R) G41 Express Chipset.
. 32-Bit Windows XP Professional Service Pack 3.
. Latest DirectX and drivers. The even better news is, this particular piece of hardware can be exceeding fast (relatively speaking, of course), given the right CPU and enough memory, so it's not like you'd have to keep 2 computers around if that were an issue with you. Well, that's it, hope someone will benefit from it. OpenGl patch fix screen miss menu! Uncompress the zip file in the folder (Path)\Bin\Raster, where Path is where Blade/Severance has been installed. and off the edge of the platform into the abyss. FIX / WORKAROUND: I fixed this error by enabling vsync in display properties. Look for "Wait for vertical refresh"
Properties. Alternatively keep hitting the Print Screen key while the cutscene is playing, to slow the framerate. Manage 3D Setting => Global Settings find "Vertical sync" make it "ON"
1) I get lucky and the level loads and plays normally. 3) The loading bar doesn't fill up all the way, and the game locks. When the game locks, it's a total blowup... I can't even CTRL-ALT-DEL out so I have to hit the system power button. Not good. Anyone had similar happen? Khazel Zalam and Tell Halaf don't exhibit the same problem so it seems to be related to the map, somehow. Using the GOG release. Looks as if you can't file for support there any more since they stopped selling it. Using the 3dfx Voodoo 1-2 graphics setting, but changing it to a different one didn't seem to make much difference (and have worse issues on the visual front). Sound setting is Miles. Not experimented much with others. Graphics card is an AMD Radeon HD 6450. System's on Windows 10. I don't remember having this problem before that but it's been quite a while since I played that far. Closing down other programs (browser, IM, etc.) didn't appear to make a difference.